Antoine Griezmann praised Atletico Madrid's strength in depth at the back after his penalty secured a 1-0 win over Levante in LaLiga. Atletico seemed off the pace for much of Sunday's encounter, yet Griezmann's successful conversion from the spot during the second half made sure they secured all three points. 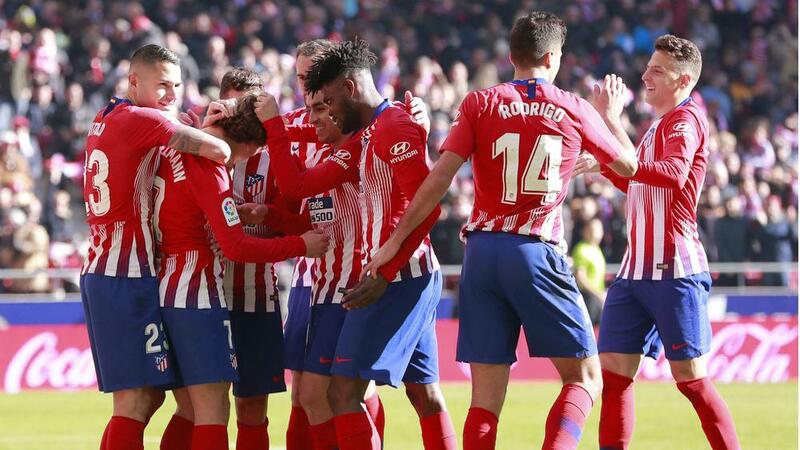 And despite acknowledging that the home side's attack failed to fire at the Wanda Metropolitano, Griezmann has lauded the resilience of Diego Simeone's squad. "We have not been very good at the top, I was the first, failing passes, my legs were heavy," Griezmann, who has now scored six goals in his last five LaLiga appearances, told reporters. "But we know that behind us we have the best defence. [Diego] Godin, as always, doing things well. "[Stefan] Savic was injured, but [Jose] Gimenez was ready to play, that's our strength. Vitolo, who does not play, had a great game today. "We leave reinforced by this victory, now we turn the page and we focus on the Copa del Rey [against Girona on Wednesday], which is a tournament we want to win." Simeone, meanwhile, felt his side put in one of their more impressive performances of the campaign so far. "Maybe it was not the best, but one of the best," the Atletico boss told a news conference. "Especially for the consistency. We had high pressure, the team had good goal situations in the first half, a goal was disallowed. "With Savic's injury, we overcame a great rival [in Levante], a team who competes well and is a tough opponent."